One of the biggest topics of discussions the last couple of weeks has centered around Rob Gronkowski, who many seem to believe is behind statistically from where he was at this time in 2017. Through six games, the veteran tight end has amassed 26 receptions for 405 yards along with a touchdown, exactly the same number he had in 2017 after catching 26 passes for 401 yards through six games last season. However, he had four touchdowns at this point last year compared to one, but that still only puts him with 3 fewer. That isn’t exactly an insurmountable number to make up now that Julian Edelman and Josh Gordon are in the mix. One thing reporters seem to be questioning Gronkowski on is whether or not his perceived lack of production is something he’s concerned with in terms of reaching his contract incentives, which he’s continued to downplay. Back in August, Adam Schefter reported that the veteran tight end can earn a maximum of $3.3 million by achieving three of four incentives. He’ll receive $1.1 million for 70 or more catches, $1.1 million for 80% playing time, $1.1 million for nine or more touchdown catches and $1.1 million for 1,085 receiving yards. Each of those bonuses would be in addition to his $8 million base salary. At this point, he’s essentially on pace to hit his receiving yards incentive (he’s on pace for 1080 yards) and close on his receptions incentive (he’s on pace for 69). While he only has one touchdown, reaching the total of 9 isn’t exactly impossible. It wouldn’t be that unusual to see him put together 3 or 4 games where he scores at least 2 touchdowns, especially now that things have started opening up with Edelman and Gordon’s presence shifting away some of the extra attention he’s been receiving through the first four games while Edelman was suspended. Gronkowski’s red zone targets has also been something the media has focused on, primarily because thus far he’s had just one target and no receptions. That’s unusual for a player who has normally been unstoppable in scoring territory, especially knowing how much of a weapon he is down there. However, even that stat isn’t that far off. While he had 9 targets last year through six games, Gronk actually had just three receptions in the red zone, two of which were touchdowns. Again, not exactly a number that Gronkowski can’t make up if he’s able to continue improving moving forward. Gronkowski was asked about that earlier this week, but brushed it off and admitted that if he’s able to start getting open, he’ll get his opportunities. Given the numbers he’s already accumulated, it’s pretty good for a player many believe is struggling. If this is Gronkowski struggling, it should be a fun rest of the year if he really kicks things into gear over the next 10 games. 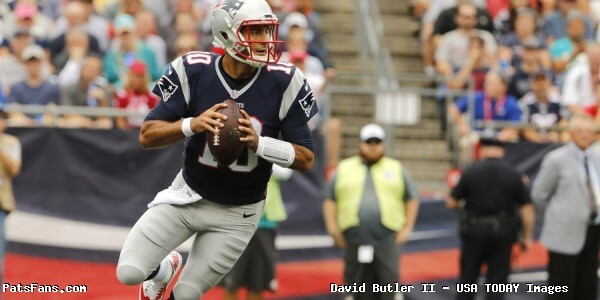 This entry was posted in 2018 Patriots Regular Season, Patriots Stat Breakdowns on October 20, 2018 by Ian Logue. Some interesting numbers after five weeks for the Patriots offense, with a different take on some stats after comparing some totals at this point last season. 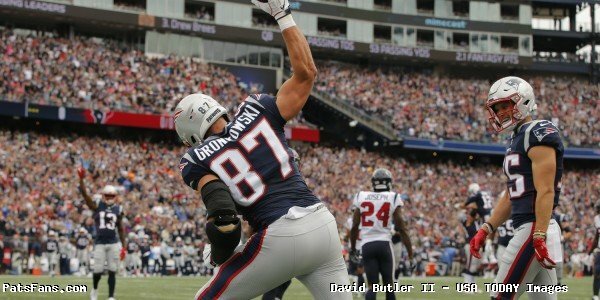 Bad News: Rob Gronkowski doesn’t have a red zone reception so far through five games on just one target. Good News: Gronkowski had just one red zone reception (a touchdown) in 2017 on six targets at this point, so he’s not far off from where he was last season in that regard. Bad News: The Patriots have 443 fewer total receiving yards so far than they had at this time last year. Good News: They have more red zone receiving yards (114yds) than they had at this point last season (107yds). Bad News: The Patriots have fewer receiving first downs (63) than they had at this point last season (79). Good News: They actually have one more receiving touchdown (12) than they had at this point last season (11). Bad News: The Patriots have just two receivers with 200+ yards receiving, with only Gronkowski eclipsing the 300+ plateau. Last season at this point, the Patriots had five receivers with 200+ yards, including two who were over 300. Gronkowski (318yds) and former Patriots wideout Brandin Cooks (379) were the two with those totals. 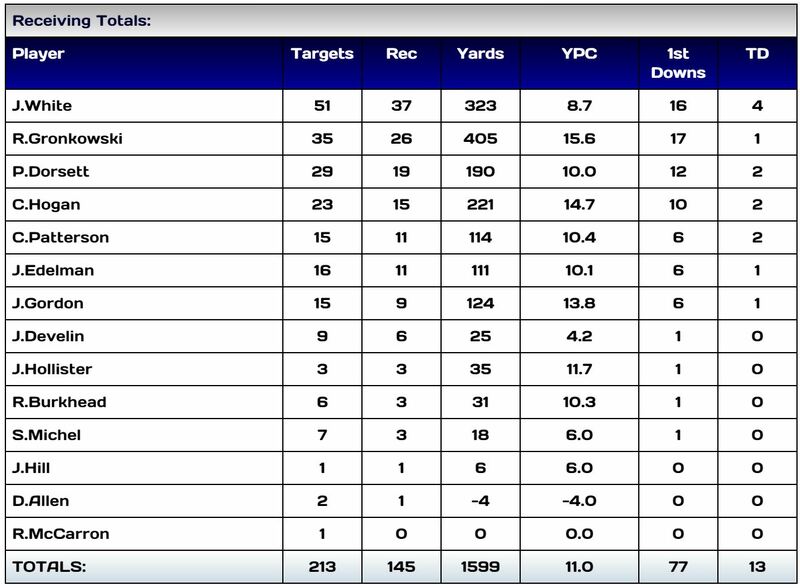 Good News: This season the Patriots have 11 receivers with double-digit yardage totals compared to 10 last season. Not exactly a huge positive, but a positive nonetheless. Bad News: The Patriots have just two receiving plays of 30+ yards so far this season compared to eight at this point last season. Good News: None…that isn’t good. However, both of those plays occurred in each of the last two games (Patterson’s 55-yd TD against the Dolphins, and Josh Gordon’s terrific 34-yd touchdown Thursday night against Indy) so hopefully, it’s a sign of things to come. Good News: Tom Brady has thrown for more second-half touchdowns (5) than he had at this point last season (3). Bad News: Four of his six interceptions so far this season have all come in the second half. He hadn’t thrown any in the second half at this point in 2017. Good News: For the most part, the Patriots offense has done a good job of staying out of long-yardage situations on offense, especially on 3rd down. At this point last season they had already faced 3rd-and-10 seven times compared to just four this season, along with having been up against 3rd-and-over-10 yards twelve times compared to just eight this season. Bad News: They’re 0-for-4 converting on those 3rd-and-10 attempts while converting just 2-of-8 on 3rd-and-over-10. 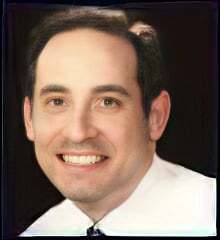 Again, obviously, not great news but that should also hopefully improve moving forward. 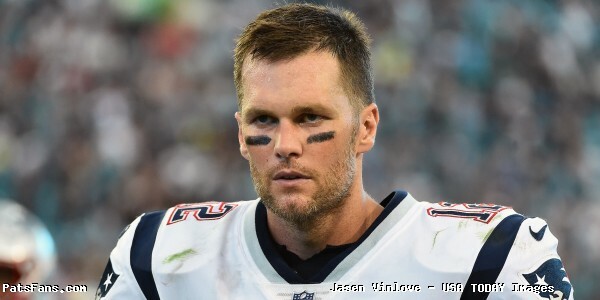 Bad News: Through four games, Tom Brady was just 15-of-30 (50%) for 143-yards with 1 TD and 2 INTs in the first quarter, compared to 33-of-49 (67%) for 433-yards and 4 TDs last season. Good News: After the Colts game, where he was 12-of-13 for 105-yards and 1 TD, Brady’s first quarter completion percentage jumped to 63% with his totals now sitting at 27-of-43 for 248yds, 2TDs, 2INTs. Players who helped raise that stat last Thursday night include James White (4/4 38yds), Julian Edelman (3/4 28yds), Corradelle Patterson (2/2 11yds, 1TD) and Rob Gronkowski (1/1 19yds). This improvement has been key as the Patriots have scored 10 of their current season total of 19 first-quarter points over the last two games. Good News: Dwayne Allen actually has a reception through five games, which is certainly better than the 0-for-6 total he carried through the same number of games last season. Bad News: That one catch went for a 4-yard loss. – Sony Michel is ahead of last year’s leader at this point, Mike Gillislee, with Michel carrying the football 67 times for 294-yards along with 2 touchdowns while averaging 4.4 yards-per-carry. That’s better than Gillislee’s 69 rushes for 246 yards, which was an average of 3.6 yards. However, Gillislee also led all rushers at the time with four touchdowns. – At this point last season, Chris Hogan had 23 receptions for 288 yards and a team-leading 5 touchdowns. So far this year Hogan has just 11 receptions for 143-yards and 2 touchdowns, just one reception ahead of newcomer Corradelle Patterson (10 catches, 10yds, and 2TDs). 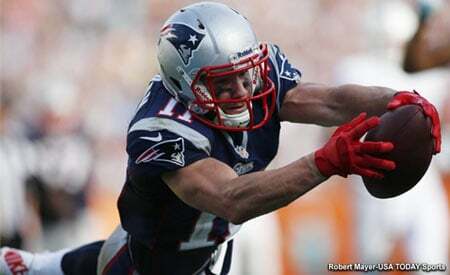 With Gordon and Edelman potentially taking the focus off of him, Hogan’s production should hopefully improve. – One final related stat for Hogan, he had five red zone receptions at this point last season, with four touchdowns after being targeted nine times. He’s been targeted just once thus far in 2018, which was a 7-yard touchdown. – It’s hard to believe that James White didn’t have a touchdown reception at this point last season, but so far in 2018 he already has a team-best 4 touchdowns. He also leads the team in receptions so far with 32 receptions for 270-yards. He also led the team at this point last year with 29-catches for 230 yards, ahead of Hogan (23) and Amendola (23), followed by Gronkowski (20) and Cooks (18), who rounded out the top 5 in that category. – Tom Brady has 8 red zone touchdowns so far, which is actually one better than the 7 he had at this point last season. White (4), Phillip Dorsett (2), Hogan (1) and Patterson (1) are the ones who get the credit for that total. Last season it was Hogan (4), Danny Amendola (1), Rex Burkhead (1) and Rob Gronkowski (1) who each accounted for that total. 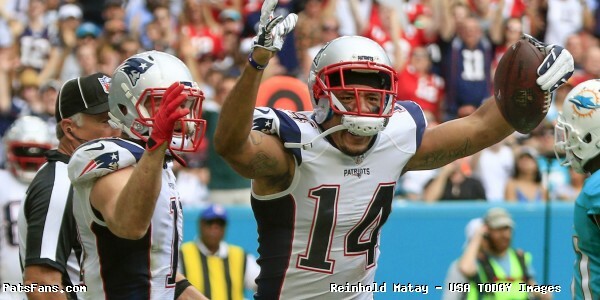 This entry was posted in 2018 Patriots Regular Season, NFL Commentary, NFL News, Patriots Commentary, Patriots Film Room, Patriots News, Patriots Stat Breakdowns and tagged 2017 Patriots Season, 2018 Patriots season, Bill Belichick, Chris Hogan, Danny Amendola, Dion Lewis, Julian Edelman, New England Patriots, NFL, Patriots, Patriots offensive stats, Rob Gronkowski, Tom Brady on October 12, 2018 by Ian Logue. Through the first three games of the 2018 season, most of the discussion has centered around the struggles of Tom Brady and the passing game and the problems they’ve faced during the team’s 1-2 start. 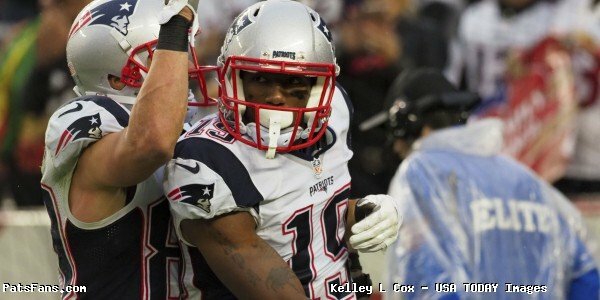 With Julian Edelman sidelined and the team adjusting to the loss of Brandin Cooks and Danny Amendola, the hope was that Chris Hogan, Phillip Dorsett and Cordarrelle Patterson would be enough to get them through but it hasn’t quite worked out the way they probably hoped. If the results don’t speak for themselves, a look at how they started last season is enough to remind us that they’re obviously playing nowhere close to what they’re capable of. Compared to the first three games of last season, there’s a drastic difference in passing yards for Brady and the offense. So far here in 2018 Brady’s currently thrown for 644-yards compared to 1092-yards during the first three contests of 2017. The number of attempts is similar, with Brady having attempted 100 passes this season compared to 110 at this point last year. The completions are also similar, with Brady completing 64 passes compared to 71 at this point in 2017. 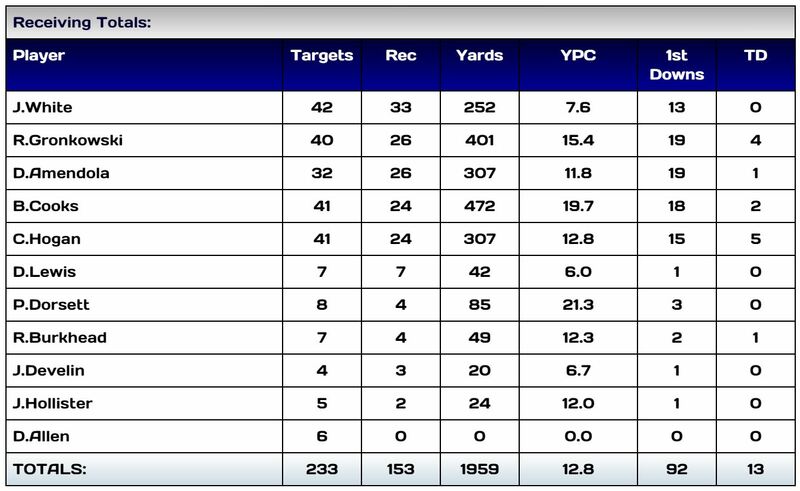 But the yards per catch rate is much lower, with receivers averaging 10.1 yards per reception compared to 15.4. But the biggest thing that stands out is the drastic difference when it comes to the contrasting numbers put up by last year’s group. At this point last season the Patriots had five players in triple digits in receiving yards, including two who had already eclipsed the 200-yard mark. This year, they have three with triple-digit yards, but none have broken 200-yards. One other big difference is the number of receiving first downs, which so far in 2018 has seen them move the chains just 32 times compared to 46 at this point last year. What’s interesting is the fact that despite the report by Rob Gronkowski’s brother, Chris, that the tight end is frustrated over the inability for his fellow receivers to get open, his number of receptions aren’t that far off from where he was at this time last season. Gronkowski had 16 receptions for 238 yards at this point in 2017 compared to just 13 receptions for 189 yards his season, so he’s only three catches off of last year’s pace. But looking at the two receiving charts by distance from each of the past two seasons, the most glaring thing that stands out is that at this point last year the team had 6 six pass plays of over 30 yards. This year, so far, they have zero. To take it a step further, at this point last season the team had 20 receiving plays of 20+ yards. This year, they have just 7. Needless to say with 13 games still left to play and Edelman coming back after this week, along with the addition of Josh Gordon, hopefully, things will improve. But so far, the numbers are certainly eye-opening and it’s clear this team is still trying to find themselves after a surprisingly slow start. 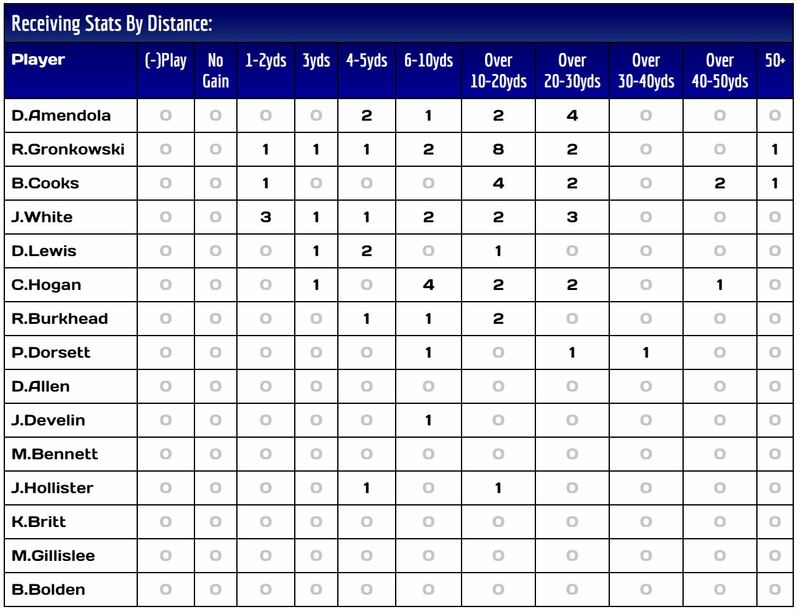 This entry was posted in 2018 Patriots Regular Season, Patriots Stat Breakdowns on September 28, 2018 by Ian Logue. Tom Brady went from having an MVP caliber season to an un-Brady-like finish where the Patriots weren’t quite moving with the same precision in the passing game as he was prior to an apparent Achilles injury he suffered against Oakland. Over the final six games, Brady and the Patriots struggled on third down, including a game down in Miami where New England finished without a third down conversion for the first time in 26-years. 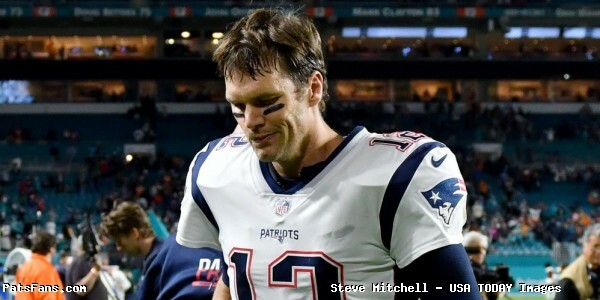 Some started predicting Brady’s demise, but instead, the numbers essentially show that Brady simply wasn’t himself while dealing with the injury. Over the first 10 games, Brady finished 62-of-96 (65%) for 778-yards and 7 touchdowns prior to his injury. After the injury, he finished 19-of-144 (43%) for 241-yards, 2 touchdowns, and 6 interceptions. The final two games of this season still weren’t easy, with Brady completing just 5-of-13 (38%) on third down over that span, including one touchdown and an interception. However, Brady was 3-of-8 Sunday against the Bills, which saw Rob Gronkowski essentially taken away as the Patriots’ game plan kept him in as a blocker and skews those totals. If it wasn’t bad enough Brady got hurt, he had to deal with his own injury while dealing with ones from his own team that factored into those numbers. With Gronkowski out of the passing game Sunday, also missing was James White, Mike Gillislee and Rex Burkhead, who joined Chris Hogan on the inactive list. Hogan spent seven of the final eight games on the sideline, appearing in just the game in Miami while Rob Gronkowski was suspended. Hogan played 55-of-61 snaps (90%) in that game, but still wasn’t himself after he finished catching just one of the five passes he was targeted on. Meanwhile, Mike Gillislee missed the same span, with the former Bills running back playing in the second to last game of the year against Buffalo. Also gone was Marcus Cannon, who went down after the Chargers game and was on the inactive list for the next five weeks before eventually ending up on injured reserve. Other than Cannon, each of those other players are hopefully expected to be healthy by the time the Patriots play their first postseason game, and Brady feels like that should certainly help their offense. With a bye up next and plenty of time to get healthier before their first playoff game, hopefully, we’ll see Brady and his supporting cast back and at full-strength when they take the field again one week from Saturday. This entry was posted in 2017 Patriots Season, Patriots Stat Breakdowns and tagged 2017 Patriots Season, Patriots injuries, Tom Brady on January 3, 2018 by Ian Logue. Jimmy Garoppolo may have only managed two regular season starts during his tenure in New England, but he certainly made the most of them. Overall, Garoppolo completed 42-of-59 (71%) for 496 yards and 4 touchdowns in his two starts last season, with his run ending after he suffered a shoulder injury against the Dolphins in Week 2 that knocked him out of the line-up and ended his tenure as a starter. One of the numbers that stands out is the fact that Garoppolo was 14-of-17 (82%) on third down last season, with 13 passing first downs, including 2 touchdowns. Week 1 Notable Numbers Against Arizona: Garoppolo’s opening season win over the Cardinals last season saw him complete 73% of his passes after he completed 24-of-33 for 264 yards and a touchdown. He was also 8-of-10 (80%) for 107yds on third down, but the interesting part of this stat is the fact he completed passes to six different receivers with 7 passing first downs. Another interesting note from this game is the fact that he finished the contest with a win, but never attempted a pass down in the red zone. Week 2 Notable Numbers against Miami: Against the Dolphins, Garoppolo opened the game completing his first eight passes, finishing 18-of-26 (69%) for 232 yards and 3 touchdowns before his injury in the second quarter while completing passes to eight different receivers. Over that span, he was also a perfect 3-of-3 in the red zone and completed 6-of-7 (86%) for 88yds and two touchdowns on third down. Garoppolo only had one other game in 2016 where he had a pass attempt, which came in a blowout win for New England in Week 16. He finished just 1-of-2 in that game for 6 yards. Two games obviously doesn’t make an NFL career but it was enough for him to secure enough confidence for a team like the 49ers to want to bring him in. Now the hope for Garoppolo will be for him to avoid the pitfalls previous Patriots quarterbacks have fallen into as starters with other teams, with past players Matt Cassell, Brian Hoyer and Ryan Mallett among names who failed to have any long-term success with each of their respective teams. This entry was posted in Patriots Stat Breakdowns on October 30, 2017 by Ian Logue. Losing Julian Edelman was obviously a difficult blow to begin the season and his loss isn’t the only thing having an effect on Brady’s totals down inside the red zone this season. So far through seven games, Brady’s completed 22-of-38 inside the 20 with 10 touchdowns. 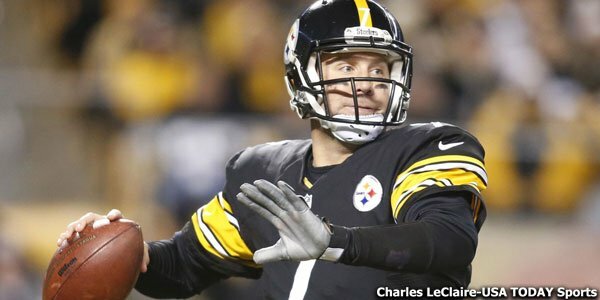 His 58% completion percentage is 11% lower than he finished with in 2016, having completed 43-of-62 (69%) with 20 touchdowns and one interception during last year’s regular season. As it stands right now, Chris Hogan has been the player who Brady’s connected with for a touchdown the most thus far in the red zone, having thrown four touchdowns out of their five completions. But they haven’t had much luck connecting consistently, with Brady having hit on just 5 of the 10 times he’s targeted him. 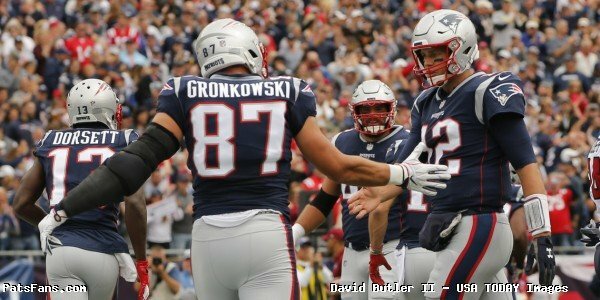 Rob Gronkowski comes in at number two, having scored two touchdowns out of the three completions Brady’s made with him this season. But he’s another player who Brady’s struggled getting the ball to, with the tight end catching just 3 passes out of 9 targets. The players he’s had the best success with so far this season in terms of completion percentage have been Danny Amendola (5-of-5) and James White (5-of-7), but each of those two players has just one touchdown each, with White catching his first of the season against the Flacons. One of the craziest stats that sticks out is the fact that Brandon Cooks has just one target down in the red area all season, which finally came during the team’s win over Atlanta on Sunday. 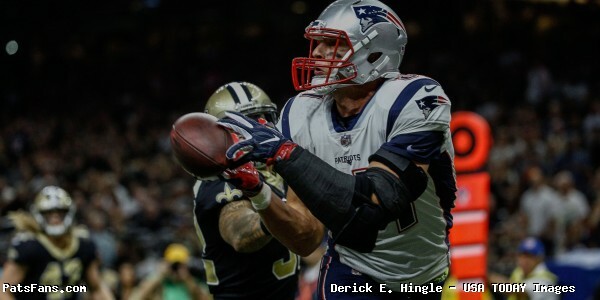 He scored a touchdown on the play, which was highlighted by the fact Rob Gronkowski destroyed everything in his path while allowing Cooks to trail behind him en-route to the end zone. It’s a huge change from last season, and while Edelman’s loss was a big one, it goes without saying that Malcolm Mitchell’s absence is significant as well. Brady connected with Mitchell on 9-of-12 targets in the red zone last season, with the rookie scoring 3 touchdowns. He’s currently sidelined with a knee injury, which is too bad given how much promise he showed last season. From there, Martellus Bennett was the other big weapon for Brady last season, with the veteran tight end catching 8-of-9 targets from the veteran quarterback with five touchdowns. Brady also had more success with Hogan last season after hitting 6-of-8 along with a touchdown, as well as James White, who caught 4-of-7 last season in scoring territory from Brady – all touchdowns. That’s what happens when you’ve got a group of talented players who are all dangerous with the football, it makes it impossible for opponents to shut everyone down and it generally leaves someone open. Unfortunately, this season, with no compliment to Gronkowski at tight end and Edelman missing from the line-up, the Patriots have had their fair share of difficulty getting any consistency. So far this season, they’ve scored 21 touchdowns but they’ve had to attempt 17 field goals, with Stephen Gostkowski hitting all but one of them so far this season. That’s a far cry from the ratio they had last season where they scored 51 touchdowns and attempted just 32 field goals during the regular season. After finishing 2-of-5 in the red zone Sunday night against Atlanta, Brady talked about their struggles again on Wednesday and he knows they’ve got to figure out a way to start punching it in instead of kicking field goals. 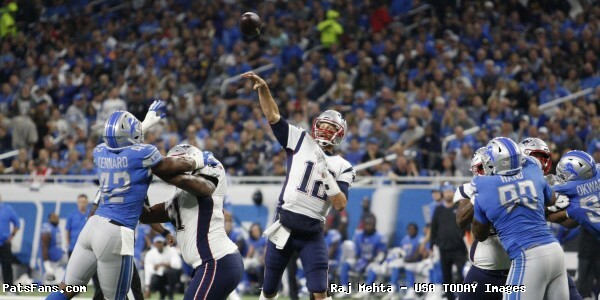 This entry was posted in 2017 Patriots Season, Patriots Stat Breakdowns and tagged 2017 Patriots Season, Brandin Cooks, Chris Hogan, Danny Amendola, James White, Julian Edelman, Malcolm Mitchell, Martellus Bennett, Patriots Red Zone Receiving, Rob Gronkowski, Stephen Gostkowski on October 27, 2017 by Ian Logue. Rob Gronkowski’s groin injury will likely be one of the biggest topics of discussion for this week, but if he’s not on the field this Sunday against the Texans, Tom Brady and the offense may find themselves back in the situation they were in during week one. Week one’s loss to Kansas City saw New England’s third down numbers as a big problem, with Brady completing just 5-of-11 throwing the football. But the biggest thing that sticks out is the fact that Brady is perfect when targeting Rob Gronkowski on third down this season, completing 5-of-5 passes for 109 yards and five first downs, including a touchdown. Gronkowski was targeted 14 times in 2016 on third down with 9 catches prior to his injury last season, with all of those receptions good for a first down, including one touchdown. 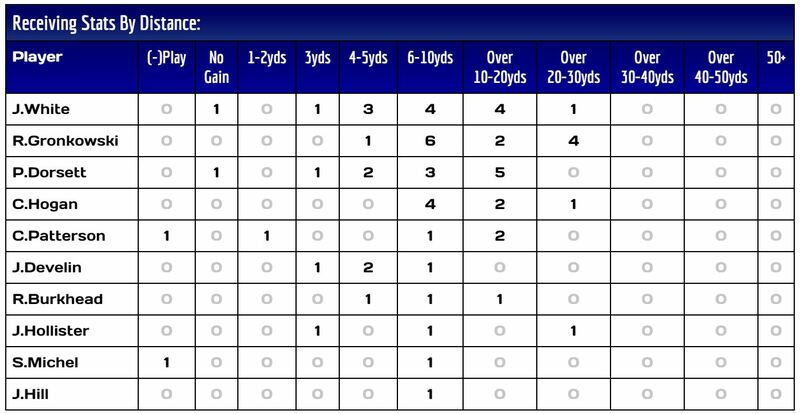 So of the last 14 passes Brady has completed to Gronkowski on third down, every one of them has moved the chains or lead to two Gronk spikes. Newcomer Brandin Cooks has yet to get on the same page with Brady when it counts thus far, with Brady 0-of-3 targeting Cooks on third down. From there, it’s James White (2/3 13yds – 1 First Down), Chris Hogan (2/3 19yds – 1 First Down [a TD]) and Danny Amendola (2/3 27yds – 1 First Down) who have moved the chains. Jacob Hollister was targeted once on third down Sunday, which fell incomplete. As a result, Gronkowski’s potential absence, especially given their current situation with all the receiver injuries, leave the Patriots in a tough spot heading into this week. According to reports on Monday, the veteran’s injury isn’t believed to be serious. But if he’s not available, how they’ll be able to overcome his absence will unfortunately be a something to watch for this week. 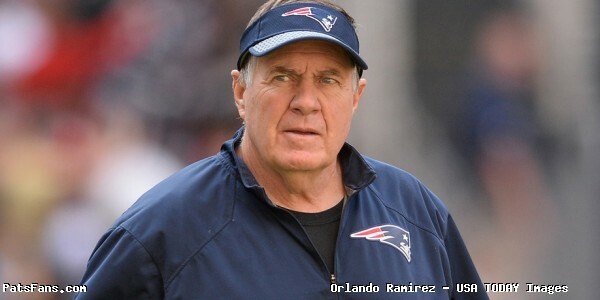 This entry was posted in 2017 Patriots Season, Patriots Stat Breakdowns on September 19, 2017 by Ian Logue.